Learn the ten things you need to know about discount printer cartridges that will help you more than you know. Printer cartridges are important items for anyone who owns a printer. However, many people are very unhappy with the high price of these commodities. According to recent studies, almost half of the people who own a printer are displeased. They think that they are overpaying for their ink. For this reason, they are always on the lookout for cheaper alternatives. Are you one of them? We do not blame you. Printer cartridges can be unexpectedly expensive. In addition to that, you might go through a cartridge a lot quicker than you might think. It doesn’t matter if you use your printer regularly or just every now and then. Buying the right cartridges can often be a hustle. Keep reading to learn more about how to buy the best discount printer cartridges! Make sure you know exactly what you are paying for. Before you commit on any purchase, make sure you know what to buy. There is a wide variety of printer cartridges on the market. For this reason, it is essential to know exactly what your printer needs. The last thing you want is to buy a huge load of printer cartridges, only to discover they’re the wrong kind! As a general rule, buying products online is often cheaper. This is also the case for printer cartridges. These items can be quite expensive at a brick-and-mortar retail location. However, websites often advertise competitive rates. These companies can afford to sell their products cheaper for many reasons. First and foremost, they don’t have as much of an upkeep cost. They don’t need to constantly maintain a retail shop and pay sales personnel. This is why they have higher profit margins. Under these circumstances, they can decrease the cost of their products. This is one of the many ways these businesses manage to stay more competitive. The web is a large-scale market. By advertising lower prices, online shops can keep a very good edge on their competitors. When looking to buy printer cartridges at a discounted rate, make sure you check the web first. There are many online shops with great prices. Buy the right printer to optimize ink costs. Before you even start looking for cheap ink cartridges, start from the beginning. The best way to save money on ink is to choose a printer that won’t run on really expensive cartridges. The web can be your best friend. Spend a little time to research your options. If you do that, you can learn what printers are known for their ink efficiency. It’s important to get a good idea of what’s available. You might think you might be spending a bit more money on a printer that’s highly optimized for ink consumption. However, the lower cost of ink cartridges will definitely be worth your while. It will save you a lot of money over time, we guarantee it. Saving money on ink cartridges is not just about finding the cheapest rates or the best sales. It is really all about being smart shoppers. During sales periods, you could also enjoy some neat seasonal discounts. Occasions like Black Friday or even Christmas sales are two good examples. These are usually great opportunities to actually stock up on printer cartridges. You can buy large amounts of cartridges at very cheap rates. You may think you might be spending quite a lot buying a large bulk. On the other hand, you will save money in the long run. Make sure you understand shipping rates. It’s important to make sure you understand shipping rates before you place an order. Some websites advertise mind-boggling prices. Everything looks amazing, and it feels like you are going to save a lot of money. However, the excitement will end once you realize the blow of the shipping cost! Don’t let inflated shipping rates fool you. Make sure you always factor in the cost of product delivery. 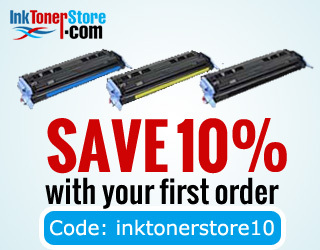 There are many ways to save money on your ink needs. Are you looking for great rates on printer cartridges? Start your free account with us. We’ll reward you with $10 off as a first-time customer!